Eva Lenz will talk about our approach of an “Aesthetic of Interaction” at DeSForM 2015 “Dynamic, multisensory, wise” in Milan. Looking forward to this event. Meet Eva and Matthias at the conference. Friday, October 16th, 11.30 a.m.
Am Freitag findet an der Hochschule der Medien in Stuttgart das Symposium “Designing for Positive Experience” statt. Am Start sind: Anna Pohlmeyer (Institute for Positive Design, TU Delft), Michael Burmester (HDM), Peter Schnäbele (Bosch), Franz Koller (UID), Matthias Peissner (Fraunhofer IAO), Andreas Wolkenstein (Uni Tübingen) und ich. Ab 10:00 Uhr, ein Besuch lohnt sich! Es ist zu einer unchristlichen Zeit. Am Freitag, den 28.11.14, habe ich die Ehre den zweiten Konferenztag der USEWARE 14 in Heilbronn zu eröffnen. Allerdings um 8:30 Uhr. Es wird aber bestimmt spannend genug, um müde Konferenzteilnehmer aufzuwecken. Das Thema ist “Kein Grund zur Freude mehr? Ein Plädoyer für die behutsame Gestaltung von Alltagsautomatisierung” und es geht – ganz passend zu dieser Zeit – um das Kaffeekochen. Hier ein paar Eindrücke aus München. Unter anderem stellten Sarah und Eva unsere Experience Design Tools vor. Außerdem wurde auch in diesem Jahr der Branchenreport der German UPA präsentiert. Wir hatten eine gute Zeit auf der M&C’14. Danke! Just arrived in Vancouver to attend DIS Conference 2014 and I love it! Looking forward to the Workshop on Environments for creative interaction design processes tomorrow where I will present our research on the Interaction Vocabulary as a design tool. Another highlight will be the opening keynote by Peter-Paul Verbeek on Monday morning, really exciting! Monday afternoon, 3:20pm, I will give a talk in the session ‘Hedonic’ and present a review on 15 years research about the concept of hedonic quality in HCI – its history, contributions, and future research directions. And then the (hedonic) gratification: the Banquet Dinner held at Science World on Tuesday night. Am 25.06.2014 freue ich mich auf einen Vortrag im Rahmen des bauhausinteraction colloquiums: “Complicated Pleasures: Designing Meaningful Moments”. Vielleicht sehen wir uns ja dort! Meet Eva on Data Ecologies symposium in Linz! Any positive experience involves the fulfillment of psychological needs, such as the need for competence or relatedness. In many cases, needs are fulfilled through activities, “enactments of daily life”, in which things play a crucial role. This creates an interesting opportunity for design. It may harness its ability to shape physical artefacts, but not to make them more beautiful, useful, or robust, but to create and mediate meaningful, positive experiences. Such an “experience-centered design” requires a thorough understanding of the psychology of positive experiences and how they emerge as well as strategies to design experiences and deliver them through the interaction with things. Especially when it comes to the design of the invisible, intangible (i.e., the experience), new conceptual tools and approaches to help designers are needed. In addition, interaction with a thing becomes crucial, as long as it is key in shaping practices. But what is an aesthetic interaction and how do design it? 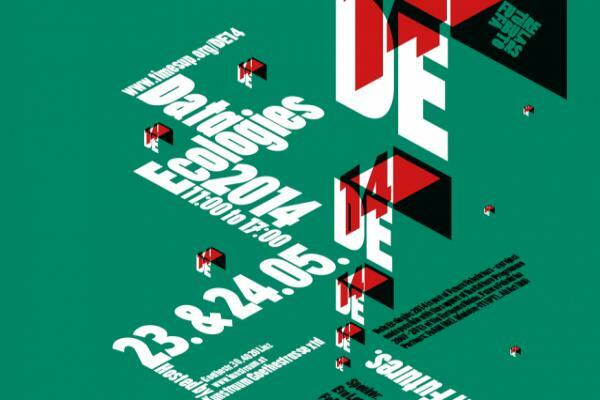 Data Ecologies 2014. Language & Tools to think out loud about Futures.